Microsoft's new version of the MCSA certification for Windows Server 2012 R2 requires passing three exams (or one Upgrade exam if you have your MCSA or MCITP in Windows Server 2008). This value-priced study guide includes more than 1,000 pages of quality exam-prep content, covering 100% of the objective domains of all three exams (as well as the Upgrade exam, 70-417). In addition, you get access to an interactive practice test environment with more than 500 questions, electronic flashcards, and videos showing how to perform the more difficult tasks. Both first-time MCSA candidates and those wishing to upgrade from Server 2008 certification will benefit from this complete test-prep guide. 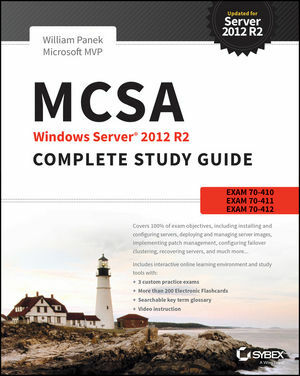 MCSA Windows Server 2012 R2 Complete Study Guide arms you with all the information you must master to achieve MCSA certification on Windows Server 2012 R2. William Panek, MCP, MCP+I, MCSA, MCSE, MCTS, MCITP, CCNA, is also a Microsoft MVP. He has been an instructor at Boston University, Clark University, and the University of Maryland, and a consultant and trainer for the United States Secret Service, Cisco, the United States Air Force, and the United States Army. Will teaches Microsoft classes throughout the country for both public and private corporations, and is the author of numerous computer books.